The alphabet had been radicalized; it marched for me now. The words, in their order, marched. This meant that I knew how to read. This meant that I could read the signs. 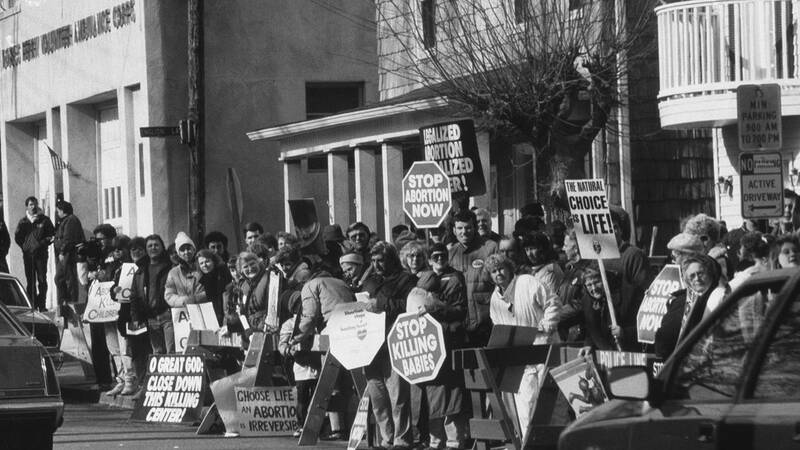 They said “ABORTION STOPS A BEATING HEART” and “IT’S A CHILD, NOT A CHOICE.” Some of the signs had pictures on them, too, always the same picture, a picture of a fetus turned to the side with its thumb touching its lips and a human rope floating out of its belly and a pulse of black omniscience for an eye. The fetus was the suffused red, lit-up color you saw behind your eyelids, or when you put your hand over a flashlight. But I did not say fetus, I was told never to say that; they had told me to call it a baby. It was morning, and we had set up camp on the sidewalks all around the clinic. If you looked at the sidewalks closely, you could see flecks of quartz and mica, and sometimes two names inside a heart, and if you paid attention you often found a penny. I was a master at finding pennies, because I was always looking down. We sat on folding chairs and rummaged in a cooler for cold drinks and fanned our faces, probably with the literature. My mother told me to stay close and not wander. I was not the kind to wander anyway, not into this kind of a crowd, which had a strong, thrumming bloodstream that might carry you off. It was not like any crowd I had met before. The energy was high, but it felt like the distinct opposite of a parade. We were waiting for something to happen, but I couldn’t tell what. Ribbons of people moved through and among us with greater purpose, but I couldn’t tell where they were going. My father was here, too, but I couldn’t see him. “Why are we here?” I asked my mother, as children sometimes will when they need to get the story going. She hesitated. “Because these people kill babies,” she said. The sentence was full of determination, as if she had made the decision to be open with me, to speak to me as an adult. I felt the shock of cold water. I said, “White babies?” because there was a book in one of our bookcases that told how babies were thrown off the sides of ships on their way over from Africa, and I must have been able to read, because I had read that. “All babies,” she responded. “Black, white, red, yellow babies. Purple babies,” she added wildly, to show how far these people would go, after something that didn’t even exist. My little brother Paul was flushed purple now, in the sun; like everything else in the world, the sun seemed to have it out for him personally. I looked up at him. His head lolled on my mother’s shoulder and a spit-up rag was tucked under his chin. Something loud and rushing had happened to my hearing—it was full, I couldn’t hear anything more. My brother was a baby. Why did we bring him here, if these people wanted to murder him? Had she gone crazy, had everyone gone crazy? That was the beginning; until I was much older, I thought that my brother was a bright and moving target. I thought that people followed us and kept him in their sights. Whenever we were in crowds, I felt them slipping through spaces with their eyes on my brother, wearing disguises, hunting him. We had been careless, and now they were after him. That he was never captured was due to my vigilance, my alertness, my awareness that they were on the family scent, that they would stop at nothing. I should have asked who—who were these people, what did they look like, why did they do it? If they were as she described them, could they even have human faces? If the enemy was so different from us, how could they walk on two legs? The atmosphere was blue and shining and loaded with something like bullets. After a moment, I understood that it was us. It was our faces, our eyes, it was the ejection of breath from our mouths. It was copper-tipped and ready, it was us. All around the clinic, we were everywhere. We glittered. Girls and their mothers walked past us with their heads down. I was waiting for something to happen. My father was sitting in a folding chair in front of the clinic’s doors, with his legs apart and his hands folded, waiting. The focus of the crowd intensified and poured toward him, as if this were church, as if he were starring in a passion play. There was a sudden whirlwind of efficient movement around him. It was the police: he was standing up peacefully, they were turning him around by the shoulders, they were putting handcuffs on him, they were leading him away, and red, white, and blue lights were going up. He had been arrested, I understood, and something else: he had gone there intending to be arrested. He was not the only one. There were a few other people with him, though I hadn’t really paid much attention to them. One of them was a nun. I heard it whispered admiringly that she had been arrested twenty-five times. I heard it whispered that she refused to eat and they had to put a feeding tube in her. I looked back at my brother just in time to see him spit up on my mother’s shoulder. His hair swirled out from his cowlick like a fingerprint, as if it were intended, as if it were someone’s design. Late that same afternoon, we went to pick my father up from jail. Where were the criminals? I wondered. Where were the murderers? Hadn’t they caught any of them? I saw only sharp corners and my father, who looked none the worse for his imprisonment. His collar opened its little white window on his throat, and he squared his shoulders at us and looked proud. Was jail something you could just try on for a while, like a robe, like a vestment? He had been given only a dry bologna sandwich and it tasted like sand, that was the first thing he told us—you know men, the saying went, always thinking of their stomachs. We drove home with him and he told us about jail. I sat next to my brother and listened, and I heard that rushing in my head again, but this time I knew what it was: blood moving in and out of human shapes across the universe. Into and out of Patricias', into and out of Pauls. One could empty at any moment. A new one could fill. My mother must have seen something in my face afterward, the way I hovered over my brother and kept close to her in crowds, because she never took me back to the clinic again. She was a kind woman. She was other things, too, but she was kind. The feeling did not leave for a long while, the feeling that death was after my brother, and then I forgot it, and remembered it only when we grew up and he went overseas with a gun in his hand and the merciless sun on his face, though that is a different story. You love your mother most when you’re hip-height and can still hide in her skirts. In the churches, from behind my mother’s skirts, I watched the women. They held third, fourth, fifth babies in their arms. Sometimes they balanced one baby against the round belly holding another. They walked more slowly than the rest of us, knee-deep in some meadow, and had a certain physical serenity, as if they’d handed their lives over totally to biology. They were happy the way crabgrass is happy, doing what they were designed to do, at large in the world, elsewhere called a weed, but they didn’t care. It was the look of vegetable love, growing wild over the kingdom of God. It was the look of bodily lushness, which takes in air and multiplies it and gives it back somehow greener. Their cheeks and lips were naked, and something else in their faces was even nakeder, some longing and some fulfillment lying skin to skin and side by side. It’s not that they thought women were mere incubators—the men might have thought that, but not the women. The women were in love with the body’s seduction of itself, they bent backward to it, they danced in their own arms and danced beautifully and looked down on anyone who didn’t. They dipped low, almost to the floor, they swirled their skirts when they weren’t wearing any, they felt a hand on their lower backs and moved with it. What it was, was a sense of pride. They wanted to be more of their noun than other women were, as John Wayne was more of a man. We are the ones, they often said among themselves, at kitchen tables and over cups of tea, who really respect women, who really understand them. It was accepted wisdom that the average feminist couldn’t tell bad indigestion from a head emerging between her legs, and that therefore the country was overrun with women in big shirts who didn’t know they were pregnant. “. . . Einstein?” they would whirl around and demand, when they were feeling especially rhetorical. Poor Einstein got aborted so often in those arguments—he was the bomb to end all bombs. If that didn’t work, what if it had been Jesus? If that didn’t work, what if it had been you? Facts and figures were handed around: fingers at this many weeks, heartbeat at this many weeks, brain activity at this many weeks. The size of a berry, a plum, a cantaloupe. Now it could feel pain, now it was dreaming, now it could survive on its own outside the womb. Facts crowded the world, like the dead and the living. At the kitchen tables, over tea, the women would dream up the worst possible scenarios, and then, at the end, they would say, in the alto tones of a martyr, “Well, I would keep the child.” Always, I would keep the child, with the flame-circled air of a person setting her jaw and throwing her head back and making the heroic choice. But what they were asking was for there to be no choice at all. That was the country they wanted. When the men walked in on these low, susurrating conversations, they looked unnerved, as if they suspected us of trying to decide something in their absence. When they walked out again, we resumed. What if, and what if? And the answer, “Then I would die,” while we, the children who would be left behind, watched from the corners of the room. *This piece was adapted from Patricia Lockwood’s forthcoming memoir, "Priestdaddy." **See below for link to the original story. --Execution Time: 4/18/2019 6:06:55 PM - 4/18/2019 6:06:55 PM = 0.0781378 sec.